The focal point of Treasure Cay is its breathtaking 3.5-mile, crescent shaped beach of powdery white sand - it simply has to be seen to be believed. It's been classed as one of the top 10 beaches in the world by National Geographic magazine! 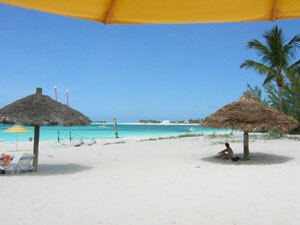 Treasure Cay is home to the second largest airport on Great Abaco Island and is a major hub for Sport Fishing. It started as a hotel and marina development some years ago and has grown into a first class vacation resort with many facilities and activities within easy reach. Treasure Cay is also home to the Wild Horses of Abaco. These rare horses were DNA tested and found to be related to Spanish Barbary ponies or Paso Finos and were probably shipwrecked here sometime after Christopher Columbus discovered the New World. Only 4 of these beautiful horses remain today, they roam free in a specially built preserve just outside Treasure Cay settlement and are the most endangered breed of horse in the world. Tours may be arranged in advance specifically for your group. The anchorage at Treasure Cay offers excellent protection for sailboats in all weather conditions and is a safe place to spend the night if the weather is unsettled. The Treasure Cay Marina has a nice swimming pool as well as many other facilities, including hot showers!